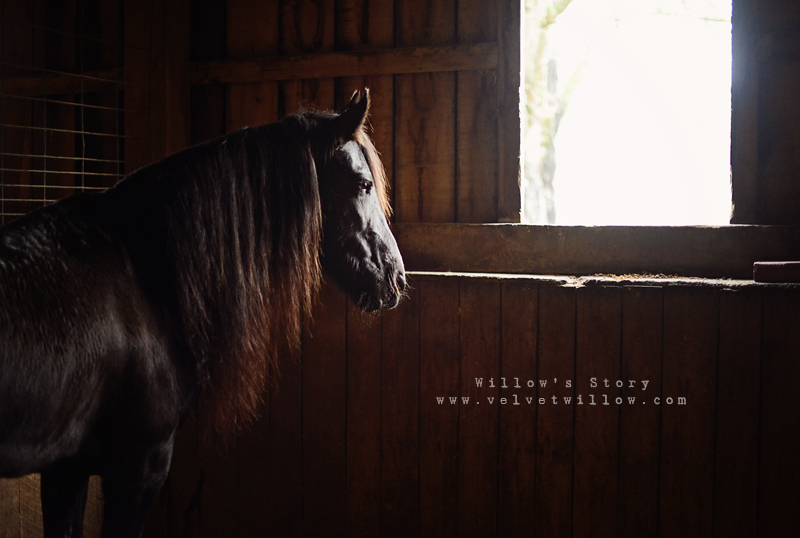 Velvet Willow: Her name is Willow. She is just so beautiful, and her name is perfect. I know she is loved, and there is no better medicine than that! I loe what you are doing, I hope someday I can do the same!!! She is a lucky little mare to have you!!! Willow's story breaks my heart and brings tears to my eyes. I'm so happy she found her way to you; you're a source of inspiration and love. I hope the two of you have a life changing journey that shows just how strong the bond between animals and humans can be when love is freely given. I look forward to following Willow's future in your respectful hands. God Bless and Good Luck!!! I'm so happy for Willow and for you - she's lovely and she will bless your lives for sure. I've worked as a trainer in the horse department of the nation's largest no-kill animal sanctuary for almost 15 years and this is a very familiar sight for us. (We've actually seen A LOT worse.) It never ceases to be heartbreaking, but it's also so wonderful to be part of the solution. I just wanted to quickly mention, we have had several horses over the years that are chronic "chokers" and our best bet for them - diet wise, especially as they are getting up to weight - is soaked timothy and alfalfa hay pellets and stabilized rice bran (plus vitamin supplements). When we have new horses in this condition they get very frequent soaked bowls throughout the day. This may be something that your vet has already prescribed, but I didn't want to not mention it as it is so helpful for our horses with this condition or horses with less than great teeth. Because the pellets are already masticated, the horse gets 100% of the nutrition from them and there is no risk of choking. Then, once they are up to speed, and if their esophagus can handle it, we feed free choice hay out of a slow feeder hay bag to discourage choking, with a supplemental soaked pellet bowl or two per day. Velvet Willow is such a beautiful name and a beautiful horse. I am so thankful and grateful to you and your husband for taking this sweet animal in to love and care for her as she heals. I think heaven has a special place for those compassionate souls like yourselves whose love and compassion compels them to help the helpless. May God continue to bless you and heal Willow!